Rock UK is a Christian charity which has been providing outdoor adventures since 1922. With four residential centres across the UK, Rock UK wanted to create an engaging Direct Mail campaign which would generate leads from School and Church Groups, encouraging them to switch to Rock UK for their residential needs. Through face-to-face meetings and team collaboration, we developed three distinct Direct Mail campaigns, each planned to land at the most appropriate time for their intended audience group. We were inspired by the Rock UK strapline of “Creating Confident Kids” when developing each of the pieces. 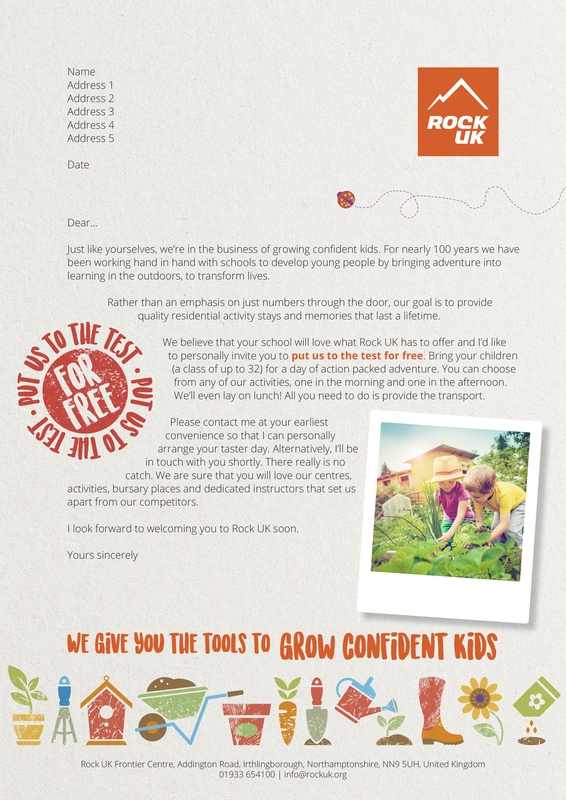 One of the Direct Mail pieces brought a particularly memorable campaign to the eyes of teachers, who were approached with the notion that Rock UK “gives you the tools to grow confident kids”. The novel idea of receiving a (gardening) tool to assist with growth and cultivation was well received by its audience – encouraging people to book the taster day that the campaign was offering.